A collaboration between Literacy Consultant Auddie Mastroleo and Hannibal ELA Teacher Michael Cook brought about an initiative for students to set SMART (specific, measurable, attainable, relevant and time sensitive) goals in relation to both their personal aspirations and independent reading. Hannibal ninth graders work together to define what a growth mindset is as a part of a mini-research unit that promotes learning and reading. Building upon the students’ research, Cook and Mastroleo co-taught a class about the difference between a fixed mindset verses a growth mindset. 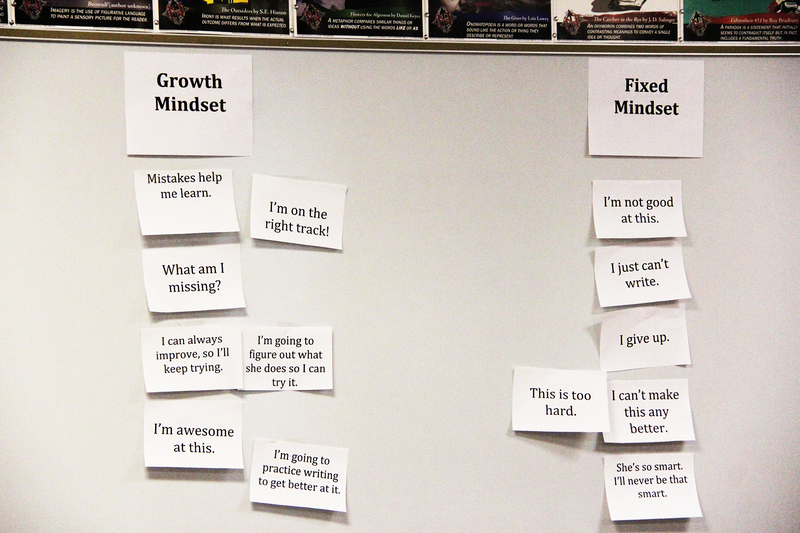 They determined whether the sayings indicated a fixed mindset or a growth mindset. Cook and Mastroleo then presented a study by Research Psychologist Carol Dweck from Stanford University, which suggests that teaching students how the brain works (growth mindset verses fixed mindset) causes them to perform better in school. Cook explained that having a fixed mindset can stunt learning and progress, while a growth mindset can encourage perseverance and the pursuit of success. 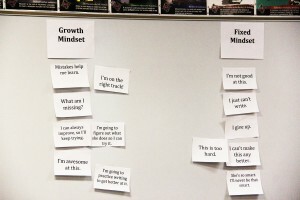 Students determine what phrases indicate a growth mindset (the idea that knowledge is progressive and always improving) and which phrases demonstrate a fixed mindset (the idea that failure is a permanent condition). Mastroleo wanted the students to apply this knowledge, and she provided a strategy to help instill and maintain grit: setting goals for personal and academic growth. “This idea of setting goals can be a really powerful tool in helping you accomplish your dreams,” said Mastroleo. Using a SMART template, the students individually wrote down specific and attainable goals for personal growth and advancement in independent reading. They set a deadline and checkpoints to maintain accountability. Teachers hope this initiative will assist in launching independent reading, promoting research learning and inquiry skills and encouraging hope and vision for ninth grade students.